The world is, at the moment, in a perilous place. The USA is putting itself at odds with most of the world and is endangering itself and its allies through its war of words with North Korea. Added to this is a burgeoning amount of natural disasters, not able to be controlled by the words or guns of man. Middle Eastern terrorism continues and all the while people become more unsure and withdraw into themselves. Sooner or later this impacts economic spending. Sooner or later this impacts economic spending. 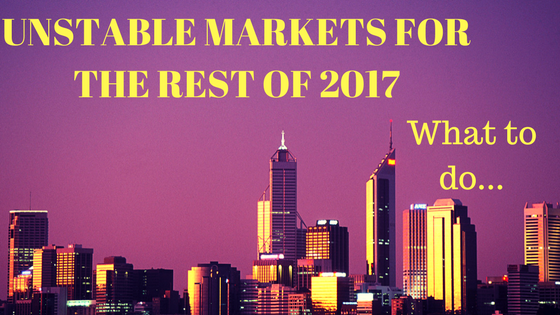 With the uncertainty being created, the resultant insecurity of mankind and the physical damage being caused by nature, the rest of 2017 shapes up as becoming more and more volatile in the markets. There is no way for analysts to be able to predict coming events with any accuracy and the markets are at risk. How Do You Protect Yourself ? Don’t be the last to know – get ahead of the crowd using Pythagoras Investment Timing Indexes. Our website has all the information to show you how Volatility can be utilised to alleviate the tension and improve your life when investing, especially when the going is hard like it was in the GFC 1. How did you fare in financial year 2008/2009 when the return for the stock market was -24% ? In that terrible year, for the 70+ stocks Pythagoras is currently offering, our recommendations returned +12% – a massive 36% better. This could have been you. Our 5 year returns are worth a look. The key to making money in any market is selling before any negative event. Pythagoras generates the sells before the events with share price effects – its proactive not reactive. Therefore Pythagoras can make money in any market regardless of the investment environment – in fact it’s best in the tough markets. We worry less about the events and their timing and focus on Volatility changes. At Pythagoras we follow changes in Volatility which precede the events. This places us at the forefront of investing. Brendan is available on 0433 726 888 to discuss how we can assist to release you from the worry of investing and get you back to enjoying life.